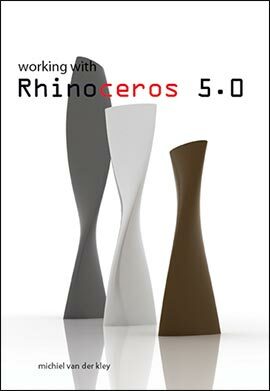 This new book (320 pages, 680 illustrations) is a user guide for working with Rhino 5, the 3D modeling and visualization program for product designers, artists, architects and sculptors. The book will teach you, step by step, to use the program. It describes drawing in 2D, building in 3D, editing in 3D, materials, light, rendering, export possibilities, scripting and a lot more with a lot of examples.